South Shelter holds 72 people. Close to the restroom building and basketball courts. 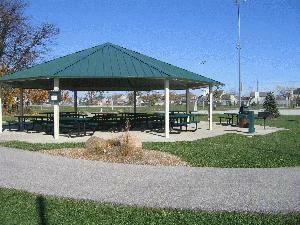 It has 12 picnic tables, including 3 ADA tables, 1 small grill. Has water and electricity. Enter off of Salisbury Street. Cost is $60 (plus tax) for 5 hours. Each additional hour is $12 (plus tax). Reservations may be made by calling the West Lafayette Parks & Recreation office at 765-775-5110 or Morton Center at 765-775-5120. Payment must be made at time of reservation. Credit cards are acceptable. Reservations are non-transferable and non-refundable. Park hours are 8 am until dusk. Shelter reservations are accepted starting January 2nd for 2016. Reservations can be made for dates starting April 1st and ending October 31st.